If you don’t know already breakfast is hands down, no competition my favorite and most labored over meal. I will cook elaborate breakfasts that aren’t even ready to eat until lunch time sometimes. It’s all of my favorite ingredients and flavors in one meal. No wonder they call it the most important meal of the day, it’s wonderful. I can’t get enough of it. 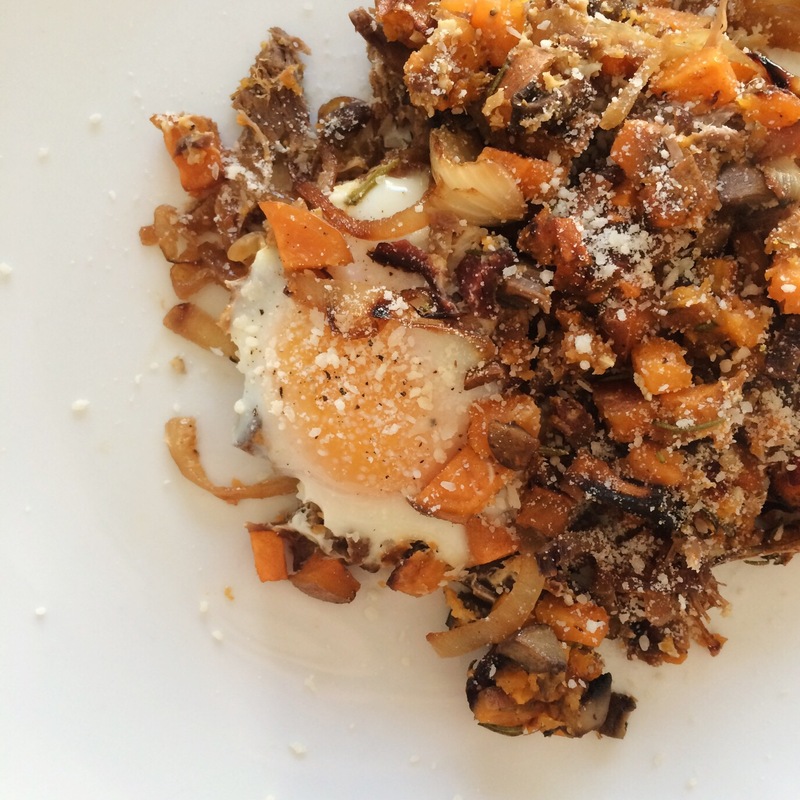 One of my favorite ways to start the day is with a sweet potato hash. I have several different variations on the dish because the ingredients offer themselves to so many different flavors and ingredient combinations. This baked sweet potato hash highlights some of the Texan flavors that run through my blood, because Texas forever, right? 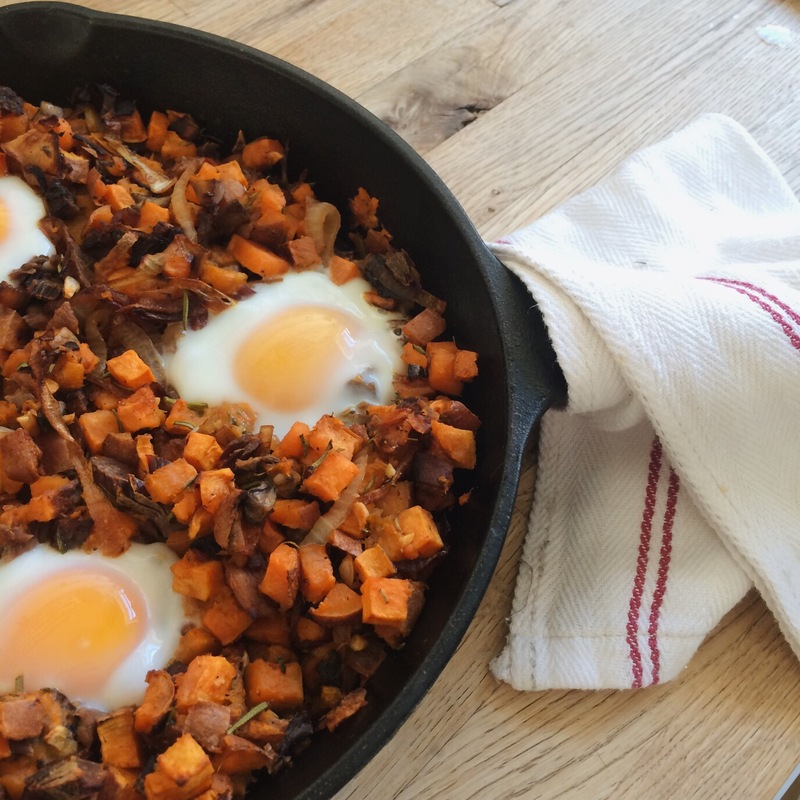 This hash has caramelized onions and smoked brisket. Sweet, smokey, savory….delicious! It has every opportunity to have several “pinnacle bites” that have every flavor in them. Serve this dish up with a piping hot cup of freshly brewed black coffee and you’ve got all you need. Of course, you can’t have it all to yourself. 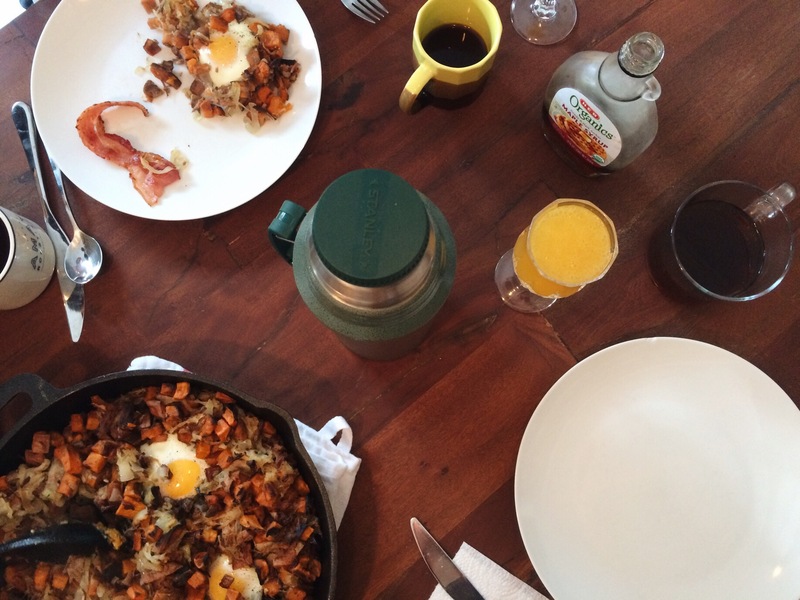 Invite some neighbors, friends or family over to share in the breakfast festivities. Meals are better when shared with loved ones. Preheat the oven to 450 degrees fahrenheit. Toss the sweet potatoes in olive oil, salt, pepper, rosemary, cayenne pepper, and paprika. Spread evenly on a large baking tray lined with foil, for the easiest clean up. Bake the potatoes for about 35 minutes of until slightly tender and browning, stirring them halfway through. No need to roast them fully because there will be a second baking. While those are baking start caramelizing your onions. In a large non-stick skillet melt the butter over medium heat. Add the sliced onions along with a pinch of salt and lower the heat a tiny bit. Caramelize them until they are deep brown and soft and incredibly delicious, about 20 to 25 minutes. Reduce the heat of the oven to 425 degrees. Stir the caramelized onions in with the roasted sweet potatoes, mushrooms and chopped brisket. Evenly dump the mixture into a lightly greased large cast iron skillet. Make four evenly spaced wells in the hash and crack an egg in to each one. Top each egg with freshly ground salt and pepper. Place the skillet in the oven, uncovered, and bake for 15 minutes. The egg yolks should still be slightly runny. *top with a sprinkle of grated parmesan cheese for an extra nice treat. Serve immediately. Eat all of it. Go into a food coma.